Mad Cow U.S.A. is not the book to read before you go out for a steak. In fact, it's not really a book to read before eating anything; this chronicle of government cave-in to pressure from the food industry just might scare away your appetite. 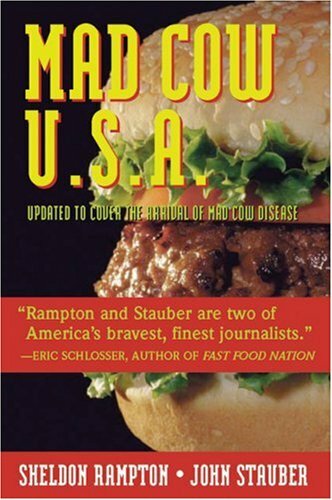 Authors Sheldon Rampton and John Stauber argue that both the American and British governments colluded with beef producers to suppress important facts about interspecies transmission of bovine spongiform encephalopathy, or "mad cow disease"--facts that might have prevented gruesome deaths. Could a British-style BSE epidemic happen in America? In a 1996 TV talk show, Oprah Winfrey attempted to ask the same question, only to find herself slapped with a lawsuit by a group of Texas cattlemen. Their grounds: the so-called agricultural product disparagement laws currently on the books in 13 states; these laws prohibit people from questioning the safety of any agricultural product, shifting the legal burden of proof from the food industry to its watchdogs. What happens when anyone who speaks out about problems with our food supply can be sued into silence? Rampton and Stauber fear grave consequences for public health, and they make a convincing case against these laws--and, inadvertently, for vegetarianism. "Rampton and Stauber concentrate on the mire of government response to an uncertain threat. In its own way that is just as terrifying as the disease itself. ... The book manages to avoid becoming mere polemic. Their scorn for various halfway measures and public-relations choices is prominent, but they have been reasonably fair in giving voice to the concerns that went into those choices. ... Could the nightmare happen here? Yes, the authors say. ... Perhaps most distressing, one could easily imagine the same set of responses to other potentially deadly but so far uncertain dangers, from global warming to meteor impact. This is indeed a cautionary tale." "Most accessible and informative... a lively account...The language is clear and straightforward... Sheldon Rampton and John Stauber tell this larger tale with style, aided by accounts of some richly colourful characters. ... Their exhaustive exploration of the people, the ideas and the growing understanding of TSEs is thought-provoking... dancing prose." "Will be received with interest by a large number of readers of different backgrounds and perspectives." "The kind of book you can't put down. It tells with great clarity a complicated story that interweaves intrigue, horror, massive economic interests, cannibalism, death, and some rather curious science. ... [The authors] have done the legwork and research necessary to produce a solid accounting of the affliction of mad cow disease, the mess that was made of handling it in Britain, and its implications for the U.S. ... required reading ..."